Volksentscheid | Guten Morgen Berlin! January 31, 2014 January 11, 2015 - Guten Morgen Berlin! Something very sad is happening in Berlin. It all started with something that wasn’t at all sad, not even a little bit. You see, a long time ago, there were some horrible people in Germany that wanted to do do vile stuff to most other people including each other, and hideously vile stuff to the rest of the people, depending on whether or not they belonged to certain groups. These horrible people, much like normal people, also liked flying from place to place and found it quite useful for getting things done, so they put together a huge airport which was completely formidable but a little scary because of the fact that it was usually full of the horrible people we’re talking about. But around that time everyone starting having a big fight, and generally this airport was just used to move fighting people and equipment from place to place rather than helping people go on holiday or fly away from the horrible people. After a while, the less horrible people managed to stop all the fighting and calm everything down, but because of the damage that had been caused during the fighting, everyone was too tired and shaken up to stop one brand new horrible person from coming along and putting an enormous wall, as wide as a giant’s leg, slap-bang in the middle of everyone’s most important city in Germany. After that, planes pottered in and out of the airport, but for a while they had to spend all their energy ferrying in food and supplies to the people living behind the wall, because they didn’t have anything to eat. And finally, the wall came down and no-one needed to get their food or fighting machines from the airport anymore, so it wasn’t really useful. But because it was an amazing, huge space, and a breathtakingly huge, intimidating building, Berlin decided not to destroy it; instead, Berlin decided to keep it, and make good of it, and turn it into a huge park so people could use all of that glorious, flat land to have fun. It was the perfect place to skateboard, and bike around, and barbecue, and practice cross-country skiing on long wheeled footplanks, and fly kites until it got far too cold to be outside until next year. Tempelhof airport is one of the things that makes Berlin worth living in. First and foremost, it is one of the coolest parks available to human beings today. It is an ABANDONED AIRPORT; not even the scriptwriters at Scooby Doo managed to come up with a setting that rad. There is nothing that makes you feel more like a twelve-year-old giddy on sugar than whizzing about on a bike as fast as you can past old bits of planes and airport buildings; you almost want to make a gun with your hand and do ‘pew pew pew’ noises at your friends as you speed about the place. There are open areas where you can have a barbeque and a lie around, there are protected areas where things like insects and birds can have babies and be happy, and – perhaps most joyfully of all – there are FENCED areas where people can bring their dogs and let them merrily defecate all over the place without spoiling the rest of the gorgeous green plain. But it’s not the park itself that makes Tempelhof so great. The most wonderful thing about Tempelhof is purely the fact that exists even at all. If an airport were closed near the centre of London, it would be immediately bulldozed and turned into a large mirrored office building nicknamed ‘The Hemorrhoid’ or some such moniker. But in Berlin, the council understood that there is value to an empty space much more than the value of what could be used to fill it. 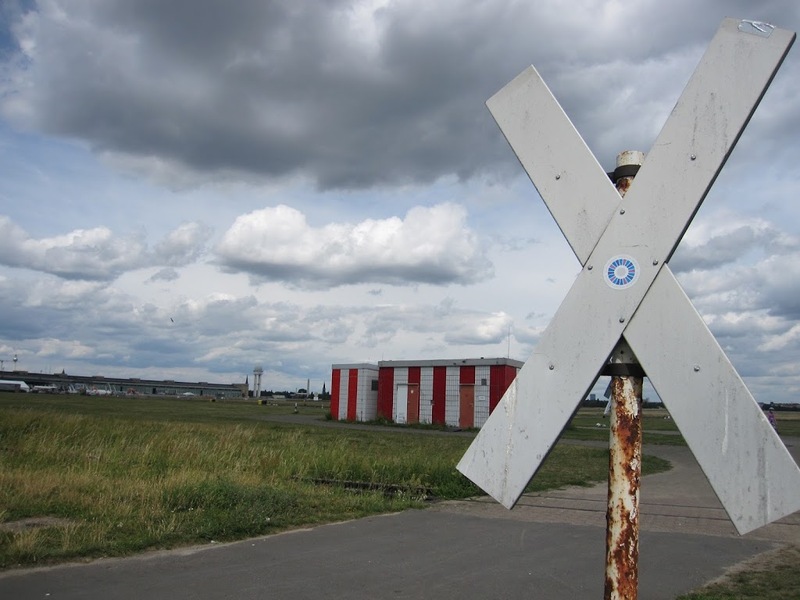 Letting Tempelhof stand was a demonstration that the people who run the city understand that people need blank, unformed space in order to enjoy themselves and be free. Given that space, the people have planted makeshift allotments, created miniature golf courses out of recycled possessions, and found a way to windsurf miles away from any large body of water. 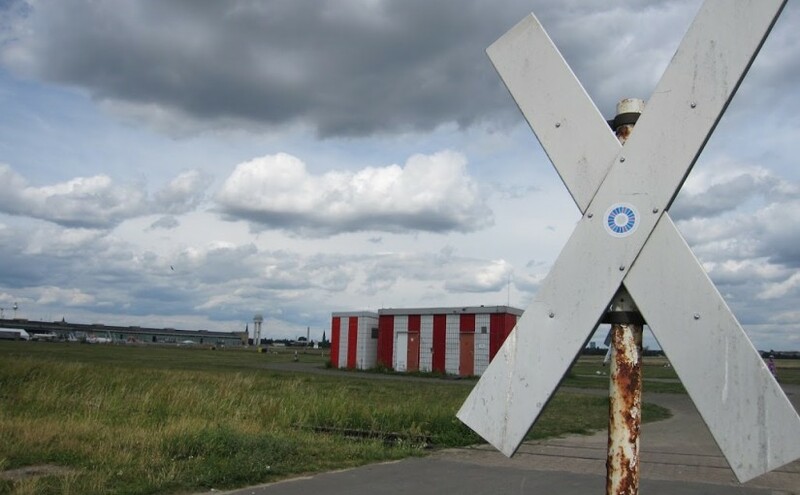 Letting Tempelhof stand showed that Berlin wasn’t about processing every last square centimetre of land into profit-making, business-endorsed ‘progress’. Ultimately, letting the airport stay simply showed that the people who run Berlin understand that deep inside every person there is a goonish, childlike thrill when you get to run rampant around a big official place that you’d not normally be allowed to go amok on. That’s why everyone has dreams about having an adventure in a museum after it’s locked up for closing time. Which all brings me to the sad thing that is happening, which is that after a long, long debate, we are now coming to the end of a rumination period where the people who run Berlin think they’d like to finally get rid of Tempelhof and build things on the land instead. Understandably, the people in Berlin were aghast about the idea, and started collecting signatures to show how upset they were by the mere thought of it. As we got near the end of the discussion time, for one shaky moment it looked like they wouldn’t get enough signatures – with four days to go, and a minimum of 174,000 signatures to collect, the activists had 40,000 too few and couldn’t start asking the city’s dogs to sign which would have quickly resolved the problem. There were people on the streets wildly trying to cajole everyone into signing (while some people might have signed and then forged a couple of other signatures based on old addresses they used to live at to boost the numbers cough cough…). The discussion phase came to an end, the number of signatures were counted, and everyone breathed a sigh of relief: there were just enough signatures. Unlike in the UK, where that huge and heartfelt bunch of signatures would be casually regarded by some suited councilman and then tossed lightheartedly into the bin, in Berlin this means that it has now come to a ‘people’s decision’, because the people have shown that they’re not willing to just let this happen without at least a decent argument. And now the argument begins. News pundits are treating this all with a great deal of glum resignation; they know, they have heard the councilmen talking, it is clear that the best we can hope for now is at least a compromise where only some of the land is built upon, and hopefully not the best bits. The councilmen sound determined and frankly baffled, completely mystified as to why people would prefer a big empty airport as opposed to some lovely new flats and a nice library. This is the mindset I came here to escape from, and I am begging you, everyone in Berlin who reads this, everyone outside of Berlin who reads this, to do everything you can to support Tempelhof and the idea in general: the idea that space is for people to enjoy and explore, that a place doesn’t become useless just because it becomes abandoned, and that there is more majesty in the shadows of the buildings of a fallen empire, buildings long since reclaimed for a better purpose, than there ever could be in shiny modern apartment blocks and community centres.